At Spencer Fine Jewelry, we know luxury and elegance. We are also your home for personalized jewelry in Dallas, Texas. That's why we innovated the luxury jewelry industry with the ability to add a real, personalized touch to your gemstone jewelry. 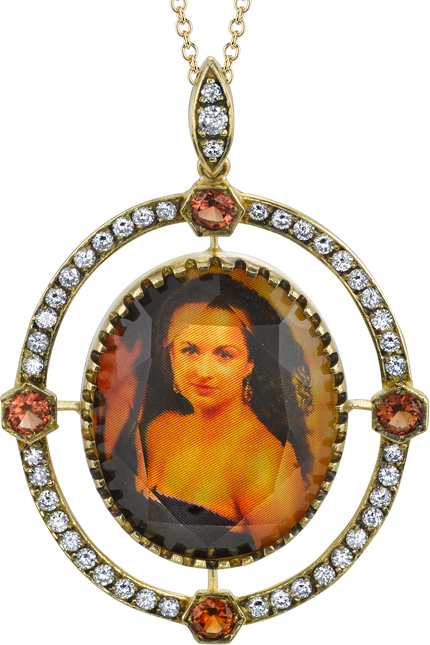 Founded in 2016 by Melissa Spencer, Spencer Fine Jewelry re-invents the art of traditional jewelry portrait miniatures by pioneering the Spencer Portrait™ gemstone jewelry method. This personalized jewelry is created right here in Beverly Hills through a proprietary process of projecting an image into elegant, natural gemstones including rock crystal quartz, mother of pearl, and occasionally diamond. The gems are then set into customizable frames of 18K gold and/or sterling silver. Finally, this luxury personalized jewelry is adorned with diamonds and colored gemstones to make it sparkle and stand out. The designs exemplify a style which draws inspiration from Egyptian, Byzantine and Victorian Eras, in conjunction with this distinctly contemporary cutting edge technique. Historically, hand painted portraits in lockets were the fashion trend of nobility and royalty. Later, dogs, horses, birds, and other animals took form in Reverse Intaglio designs. The Spencer Portrait™ re-imagines the subject of these treasured objects, while maintaining their intention — the depiction of what the heart holds most dear, forever immortalized in an authentic gemstone jewelry piece. Our Dallas, Texas high-end jewelry store is unlike any other in the world. Because we have developed our own unique method for creating one-of-a-kind personalized jewelry using natural colored gemstones, Spencer Fine Jewelry is the only place you will find this type of craftsmanship and style. Contact our Dallas, Texas fine jewelry store today to schedule an appointment to create your own personalized jewelry. Melissa Spencer is a Dallas, Texas jewelry designer whose creations blend contemporary style with antique legacy. Her inspiration originates from integrating her education in photography, architecture, and fashion design with the craft of fine jewelry making. She holds a B.A. in Photography from Southern Methodist University, and a G.J.G. from the Gemological Institute of America. Melissa's studio is in Los Angeles, CA.